Welcome to the first issue of "Wilson's Numismatic Repository," and it is my most fervent hope that you will enjoy the comments offered here and in the few following pages. The intent of this little periodical is not necessarily to present information of earth-shattering importance, but rather to have a little fun, and perhaps create the medium for an open forum for the exchange of ideas, comments, opinions, etc., relating to the pursuit and enjoyment of numismatic literature. At present, I have no delusions of issuing this periodical on a regular basis, as the operation of a one-man business precludes such foolishness. However, I fully intend to publish from three to six issues annually if it is enthusiastically received by its recipients. All persons presently on my mailing list will receive copies, and it will be made available to anyone requesting it at no cost. Now, even if it's not very good, the price should spur the aforementioned enthusiasm. Some of you have been customers since I first began issuing fixed price lists nearly two and a half years ago; and I have been privileged to meet many of you personally during the A.N.A. and other regional, state and local conventions. For those of you who may only recently have communicated with me, perhaps a very brief biography is in order. Even if it's not, this is my publication, and I can do anything I want to. So, here goes. I first saw the light of day on August 18, 1944 in Pensacola, Florida, the firstborn of a career Navy family. Being a service "brat" had a strong influence on my early interest in numismatics, as my father quite frequently was deployed to "far away places with strange sounding names," affording him the opportunity to obtain the coinages of the various countries he visited. These odd little pieces were generally dispersed among my two younger brothers and myself; however, I was the only one of the three of us to seriously pursue numismatic study with any interest. 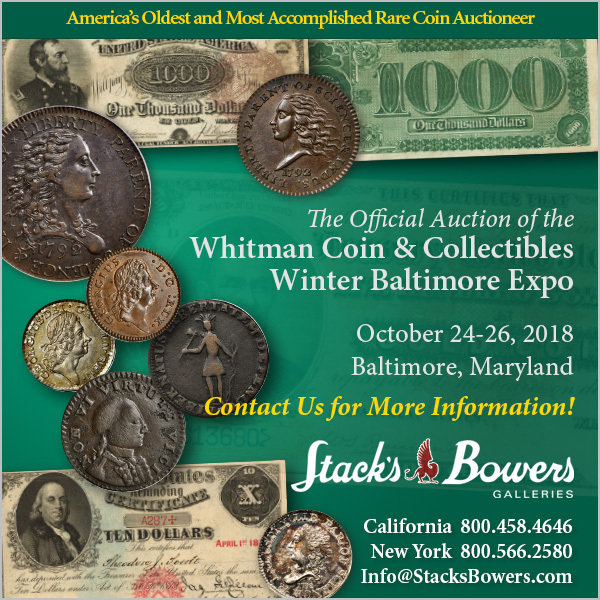 During the mid fifties, while attempting to earn my Boy Scout merit badge in coin collecting, I had the good fortune to encounter a fine and wise coin dealer in the small hamlet of Brunswick, Maine where my father was stationed at the time. He was the local counselor for our scout troop, and it was during my first visit that he advised me to follow the wisdom of the late Aaron Feldman and "buy the book before the coin." So it was, that on that Fall day in 1957, I began my numismatic "library" with a brand new copy of the thirteenth edition "Redbook." I became obsessed with the hobby in general and, having always been a voracious reader, with the bibliophilic end specifically. My collecting interests continued unabated until I graduated from high school in 1962. From that time until about six years ago, the hobby had lost me. After leaving college, I ventured West and settled in Sacramento, California where I began my professional career in the container industry. In 1968, I married Lynne Elliott, and for the next six years the two of us spent our time alternating between the West Coast and the Midwest as a result of frequent transfers offered by my employer. Finally, in 1974, I changed companies and settled in ‘Fremont, California. I was finally able to "settle down" in one place, and at that time, my numismatic yearnings resurfaced stronger than ever. Having been removed from the hobby for some twelve years, I soon discovered that a virtual "mountain" of information and literature had been dispensed during my hiatus. I had to have it all. Though, at the time, I was still more of a coin collector than bibliophile, I felt the need to buy everything printed on the hobby. It wasn't long before the quest for knowledge prevailed over the desire to collect the actual coins, and I soon found myself buying entire libraries to obtain that one or two pieces I just had to have. By now, I was vest-pocketing as a coin dealer at local shows, and I began offering a few duplicate books at my table. Surprisingly, interest in the literature was quite strong, and within a period of less than six months, I was setting up at the shows with only books, having almost totally disposed of my coin holdings. But, coin shows only come about once a week, and I had to be more involved than that. So early in 1980, I ran my first advertisement in "Coin World" and "Numismatic News," offering a complete set of Redbooks, and requesting want lists. I was deluged with offers to buy and sell books, periodicals, catalogues and all manner of related material. It soon became apparent that in order to properly service the needs of my new-found customers, I would be forced to make perhaps the most important decision of my life. After more than fifteen years in manufacturing, and with a fine upperlevel management position which allowed me to live quite "comfortably," I made the decision to try the book market on a full time basis. That was just over a year ago, and I have no regrets so far. Certainly, the financial rewards, so far, are considerably less than when I was surrounded by the security of a nice "guaranteed" salary. But at the same time, I have never enjoyed myself more, and I wouldn't trade anything for the many friendships which I have acquired in the past fourteen months. I plan to stay in this business for a looooong time!